A particular style of iron/manganese/hydrogen sulfide filter that has become very popular in recent years combines aeration in the same treatment tank with the filter media. These are sold under a variety of names, like AIO, “iron breaker,” and “iron ox.” (We call them “single tank aerators.”) It is understandable that they are popular. They are effective removers of reasonable amounts of iron, manganese, and hydrogen sulfide, they cost less than most alternative methods, they save space, and they are relatively easy to install. Single tank aerators are built like a standard backwashing filter with iron/sulfide media like Filox, Birm, Katalox, or Catalytic Carbon in a “mineral tank” with a control valve on top to backwash the media. They differ from standard filters, however, in that the control valve is a water softener valve that has been modified to draw in air instead of a brine solution. During regeneration, the control valve draws in and stores air in the filter tank. During the service run, this compressed air is used to speed up precipitation of the targeted contaminants. Since air is taken in only during regeneration, the regeneration process has to happen often. In most cases, a daily regeneration is required for residential treatment. In air-induction units, air is drawn in through the screen-protected port during the daily regeneration cycle. There are a couple of issues that should be kept in mind if you’re considering getting a single tank aeration/filtration unit. One is water usage. Single tank units have to regenerate every night, and they use more water per regeneration than conventional non-aerating filters. The table below looks at water usage for a typical 10″ X 54″ single tank aeration iron filter as compared with a non-aerating conventional iron filter of the same size. The chart assumes that the iron level is moderate and the iron filter can be regenerated every third day. The aerating filter must must be regenerated every night to maintain its air charge. Air Draw Unit, regenerating every day. Conventional Backwashing Filter, regenerating every third day. Regular Backwash Cycle 10 minutes @ 5 gpm. Total: 50 gallons. 10 minutes @ 5 gpm. Total: 50 gallons. Air Draw Cycle 40 minutes @ 1 gpm. Total: 40 gallons. No air draw cycle. Total: 0. Rinse Cycle 1 minute @ 5 gpm. Total: 5. 2 minutes @ 5 gpm. Total: 10. Total Gallons Per Year: 34,675 gallons. Total Gallons Per Year: 7,300 gallons. Stated differently, while a conventional iron filter may use 140 gallons of water per week, an air-induction filter of the same size will use about 665 gallons per week. This is water that is drawn from the well and also waste water that has to be disposed of. Another issue to be considered is upkeep. Filter control valves running on clean city water usually go years without internal parts failures. Not so with well water filters that have to deal with contaminants like iron and high sediment levels. Filter control valves have inner seals that degrade when exposed to harsh water conditions. Such degradation is regarded as normal wear and tear, and well owners should expect to do fairly frequent maintenance on inner control valve parts like pistons and seals and spacers. While this is true of all iron filters, single tank aeration units are much more prone than standard units to experiencing inner gasket failures. This is probably due in part to frequency of regeneration but it is more specifically because the 40-minute daily air draw cycle dries out and corrodes sensitive inner parts and leads to early failure. 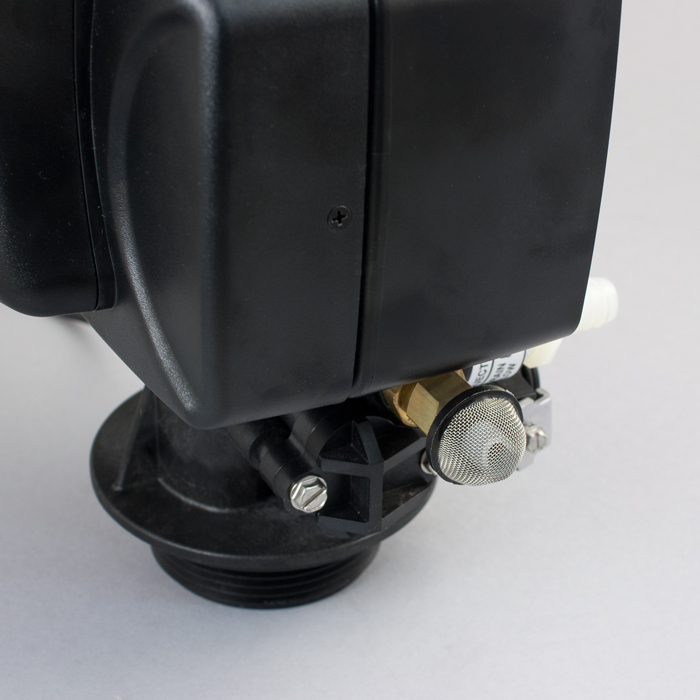 Single tank aerators offer a quick and relatively inexpensive solution to well water problems, but buyers should be aware that they have some drawbacks.